Stainless Steel Cameras that are designed for extreme environments. Perfectly designed for a wide range of automotive, industrial, and marine applications such as, construction vehicles, mining, and sea vessels. 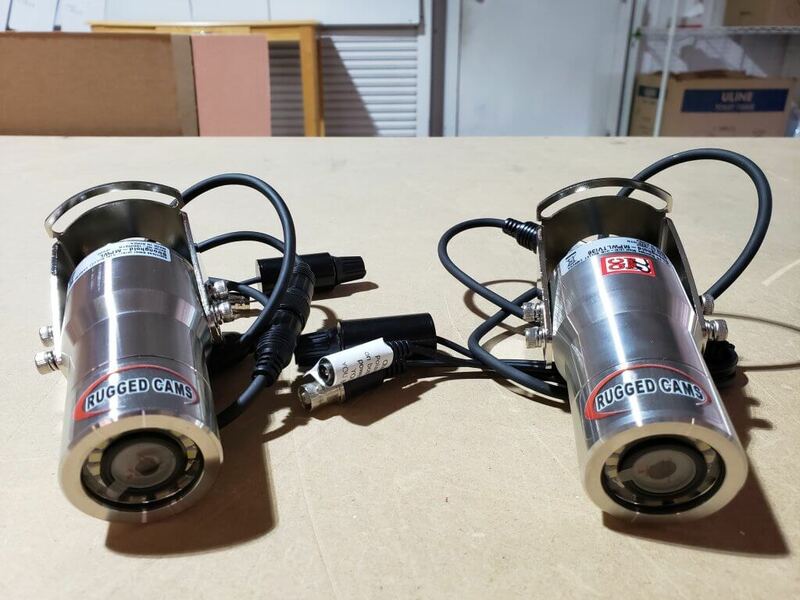 The high grade 316 stainless steel that we use to make these cameras, is not only salt and rust resistant but is also anti-germ so that it can be safely used in the food processing industry as well. The one of a kind white light can illuminate engine rooms, inside of vessels or tanks, or any dark area that you need to see from time to time. Plus the white light is controlled by the potentiometer that can turn on the lights and vary the intensity from totally off, all the way up to blinding bright. The 15 white light lamps are long-life infrared chip lights that give you surprisingly bright white lighting that allows you to illuminate the immediate area, the engine room, or the tank you are working in. Use this incredible camera anywhere you need clear, normal lighting that can be intensity controlled. The StrongHold-MP/WL has a 3.6mm lens that gives you a full 75-degree field of view, with a resolution up to an incredible 700 lines (960H – Sony super HADII – low illumination model). The StrongHold-MP HD-TVI White Light has a 3.6mm Megapixel lens that gives you a wide 75-degree field of view, with a resolution up to an incredible 1080p using the HD-TVI format and the 1/2.8″ Sony Exmor image sensor. Both of these cameras are not only great for stationary viewing solutions but can be used as a mobile camera as well. Check out all the StrongHold series of cameras on our website or call one of our Sales Engineers here at RuggedCams toll-free 866-301-2288. This entry was posted in Blog, Business and Industry, employee theft, Industrial Security Camera Systems, Outdoor Security Cameras, Protect Your Business from Crime, Security Cameras for Business and Industry and tagged stainless steel cameras.